The crêpes are a traditional French dish. They are prepared in a variety of ways. Those who have salted flavors are often filled with cured-meat, while the sweet ones are usually filled with chocolate, confectionery or creams of all kinds. But what is the traditional recipe of crêpes (universal for both types)? Break the eggs in a bowl with high sides mixed with a fork. Then add the milk and combine these two ingredients. Place a strainer on the container and then sift the flour into the bowl. Then stir vigorously with whips to absorb the flour. Continue to stir until the mixture is homogeneous, smooth and free of lumps. Afterwards, cover the bowl with plastic food wrap and let stand for at least 30 minutes in the refrigerator: this operation serves to absorb any lumps. After this time stir the mixture to revive him and then heat a crêpe maker or a pan with the same sizes. Grease it with a knob of butter. When it reached the room temperature, pour a ladle of dough sufficient to cover the surface of the pan: you can help yourself in this method with the appropriate stretch batter for crepes or in alternative turn the pan until the compound will be well distributed. You have to perform these operations very quickly, because the batter will cook quickly! After about 1 minute at medium-low heat, you should notice a slight browning, the edges will tend to detach, therefore you have to rotate the first crêpe with the aid of a pallet. Now you have to cook the other side at the same time for about 1 minute. Once you have cooked the first one, put it on a serving dish or on a cutting board. Repeat this method until finishing the dough, so you should get 8 crepes of 20 cm diameter. 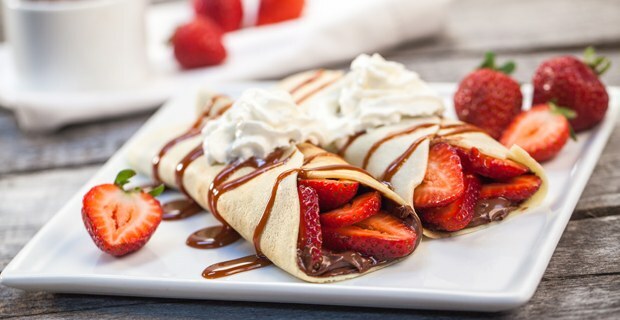 Follow this advice: put one crêpe above the other ones: in this way they will remain soft! Now, take your crêpes and fill them as you prefer! Don’t you know how to fill your crêpes?